Studies show increased mortality among severely injured patients not met by trauma team. Proper triage is important to ensure that all severely injured patients receive vital trauma care. In 2017 a new national trauma plan was implemented in Norway, which recommended the use of a modified version of “Guidelines for Field Triage of Injured Patients” to identify severely injured patients. A retrospective study of 30,444 patients admitted to Haukeland University Hospital in 2013, with ICD-10 injury codes upon discharge. The exclusion criteria were department affiliation considered irrelevant when identifying trauma, patients with injuries that resulted in Injury Severity Score < 15, patients that did receive trauma team, and patients admitted > 24 h after time of injury. Information from patient records of every severely injured patient admitted in 2013 was obtained in order to investigate the sensitivity of the new guidelines. Trauma team activation was performed in 369 admissions and 85 patients were identified as major trauma. Ten severely injured patients did not receive trauma team resuscitation, resulting in an undertriage of 10.5%. Nine out of ten patients were men, median age 54 years. Five patients were 60 years or older. All of the undertriaged patients experienced fall from low height (< 4 m). Traumatic brain injury was seen in six patients. Six patients had a Glasgow Coma Scale score ≤ 13. The new trauma activation guidelines had a sensitivity of 95.0% in our 2013 trauma population. The degree of undertriage could have been reduced to 4.0% had the guidelines been implemented and correctly applied. The rate of undertriage at Haukeland University Hospital in 2013 was above the recommendations of less than 5%. Use of the new trauma guidelines showed increased triage precision in the present trauma population. Studies show increased survival among severely injured patients met by a dedicated trauma team [1–6] and that implementation of trauma centers improve outcome in trauma patients [1, 7–13]. Trauma centers require a vast amount of human and financial resources to function as intended [14, 15]. In order to justify the expense, it is essential to maintain a reliable system able to identify patients with severe injury, while excluding non- and minor injuries. Early trauma evaluation can be a challenge. In light of its dynamic nature, the wide range of possible injuries and the limited tools at disposal, occasional mistriage is to be expected. Mistriage is divided into under- and overtriage: Undertriage is defined as the proportion of severely injured patients not managed by a dedicated trauma team, while overtriage is the proportion of patients not severely injured but still receiving such care. The degree of undertriage is an indicator of the sensitivity of the trauma system. Overtriage is unfortunate as it is costly and exhausts human and financial recourses [16, 17]. Undertriage of less than 5% and overtriage of 25–30% is deemed acceptable according to the American College of Surgeons, Committee on Trauma . All the Regional Health Thrusts in Norway have recently implemented the “National Trauma Plan 2016”, a national protocol for managing trauma patients. The new trauma plan recommends the use of a modified version of the “Guidelines for Field Triage of Injured Patients” nationwide for field triage as well as in hospitals, including pediatric trauma (Figs. 1 and 2) . The guidelines recommend a four-stage triage process based on deviations in vital signs, anatomical injury, mechanism of injury (MOI) and special considerations, in descending priority. Patients who fail to meet the physiological criteria should be evaluated in terms of anatomical injury, then in terms of mechanism of injury, and so on. The decision scheme is widely implemented in the US health care system [20, 21], has been regularly revised since its inception in 1976, and underwent its latest update in 2011 . Several studies have found the tool to be highly sensitive for identifying severe trauma (> 95%) [22, 23]. However, some studies indicate a lower sensitivity than previously thought , especially among elderly patients [25–28]. The Norwegian health system is divided into four health thrusts. Each thrust has a regional trauma center in addition to acute care hospitals with trauma function. Trauma centers provide definite care for all injuries and have access to all surgical specialties. Our study was conducted at Haukeland University Hospital (HUH). HUH is the local hospital for a population of 380,000 inhabitants and also serves as a regional trauma center for 1.1 million people in Hordaland, Rogaland and Sogn og Fjordane counties . This region consists of five acute care hospitals, with HUH functioning as the regional trauma center in Western Norway. The national burn unit in Norway is located at HUH. HUH admits approximately 350–400 trauma patients each year, of which 75–90 have ISS ≥ 15. Trauma team activation at HUH is based on initial pre-hospital information or on in-hospital clinical assessment. Single-tiered trauma team is used regardless of the assumed degree of injury. Until 2016, HUH used local criteria for trauma team activation. These criteria were mainly centered on anatomical injury, MOI and, to a lesser extent, vital signs. Despite undertriage being acknowledged as a useful tool when assessing the quality of a trauma system, no systematic investigations of triage accuracy have previously been conducted at HUH. The purpose of this study was twofold: to investigate the rate of undertriage at HUH, and to evaluate the ability of the modified version of the “Guidelines for Field Triage of Injured Patients” to identify severely injured patients. Our retrospective study included 30,444 patients admitted to HUH in 2013. Data were obtained from HUH’s patient registry, which entails information about all patients who have received specialized health care services. Patient identity was anonymized. The data set was based on discharge codes according to the 10th version of the International Statistical Classification of Diseases and Related Health Problems (ICD-10). The patients in the data set had codes ranging from S00 to T88. Injury Severity Score (ISS) is a well-established scoring system for multi trauma, used to determine injury severity and risk of mortality . Each injury is categorized according to the Abbreviated Injury Scale (AIS) . ISS is the sum of squares from the highest AIS grades in the three most severely injured ISS body regions (see Appendix for further details). In order to find potentially undertriaged patients among the 30,444 admissions, we excluded patients admitted to departments considered unlikely to handle trauma (Table 1) and patients with single injuries where the AIS score was ≤3 (Table 2). Patients with multiple injuries in the same body region where the highest injury gave AIS ≤ 3 and where there were no injuries to other body regions, were also excluded (Table 3). Lastly, we excluded patients registered as trauma team recipients. This process was done by using filtration in Microsoft Excel and the local trauma register (see Appendix for details). Following this, 2579 medical records were manually reviewed by the first and second author. We now excluded patients with ISS < 15 or admitted > 24 h after time of injury. Every patient with ISS ≥ 13 was double-checked by the last author. One patient with ISS ≥ 15 was already registered as undertriaged in the local trauma register but was not identified in our filtration due to incorrect ICD-10 coding upon discharge (lack of S or T codes). Burn patients were excluded. The reason for this is that patients with isolated burn injuries were not routinely considered in need of trauma team according to practice in 2013. They were instead handled by a dedicated team from the burn unit. 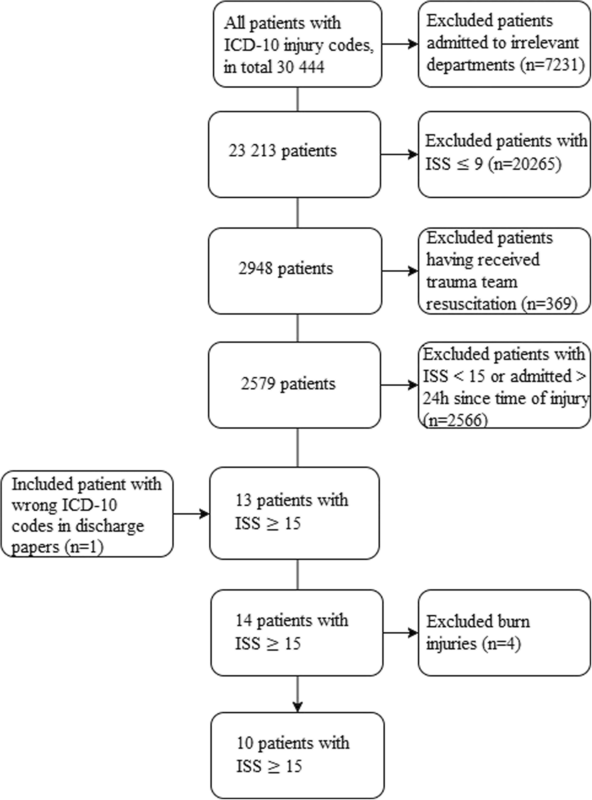 The remaining patients had ISS ≥ 15, were admitted < 24 h after time of injury and not met by trauma team (Fig. 3). Sensitivity and undertriage was defined in the same way as in another Norwegian study: Sensitivity as the proportion of severely injured patients managed by trauma team, and undertriage as the probability of a severely injured patient not receiving trauma team resuscitation during admission (i.e. 1-Sensitivity) . The guidelines’ sensitivity was assessed by acquiring vital signs, anatomical injury and MOI from emergency department journals and emergency medical technician journals from every severely injured patient. We did not investigate the decision scheme’s specificity as this was considered beyond the scope of our study. Informed consent was not required, as undertriage is part of the trauma system quality assessment. Approvals from the Regional Committee for Research Ethics and the Data Protection Official were waived (ref. no. 2015/259). In 2013, 85 of the 369 patients who were met by trauma team were severely injured (ISS ≥ 15). Ten severely injured patients did not receive trauma team resuscitation. In total, 95 patients qualifying for trauma team activation were admitted (85 + 10). This gives an undertriage of 10.5% (1–85/95 or 10/95) (see Table 4). A further look into the characteristics among the undertriaged patients disclosed the following: Nearly all (nine) were men, with a median age of 54 years and median ISS of 16. Half of the patients were 60 years or older. With regard to the mechanism of injury, all of the patients experienced blunt trauma by fall from low heights (< 4 m). Eight patients had injuries located to a single anatomical region, while two patients had ≥2 body regions affected. A majority (seven) experienced injuries to head or neck. Six patients were diagnosed with traumatic brain injury (TBI) (See Appendix for definition). Six patients had Glasgow Coma Scale score (GCS) ≤ 13, either in- or out of hospital. The patients’ Glasgow Outcome Score (GOS) (see Appendix) ranged between 1 and 5. Seven patients scored 5, one scored 4. The remaining two patients died (GOS 1). The deceased were aged 79 and 86, with ISS 26 and 25 respectively, and both died from injuries to a single body region. See Table 5 for further details. 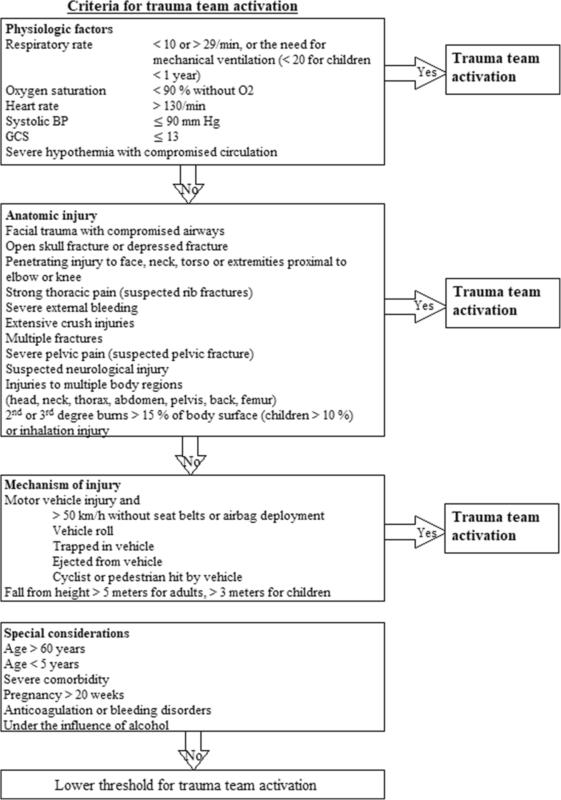 We retrospectively applied the Norwegian “Guidelines for Field Triage of Injured Patients” as stated in the national trauma plan, on all the severely injured trauma patients in 2013 (patients with ISS ≥ 15, both undertriaged and correctly triaged) to evaluate the guidelines’ ability to identify severe trauma. Out of the 95 severely injured patients, the decision scheme identified 90 patients, showing a sensitivity of 95.0%. Deviation in vital signs was the highest-ranking criterion in 65 patients (68.0%). Among the undertriaged patients, six out of ten could have been identified as severe trauma based on vital sign deviation (reduced GCS). Anatomical injuries were the highest-ranking criterion in 21 patients (22.0%). Four (4.0%) were identified from MOI alone. None of the undertriaged patients could have been identified based on anatomic injury or MOI alone. By retrospectively applying the guidelines to the 2013 patients, the undertriage was reduced from 10.5 to 4.0%. Retrospective data from 2013 indicate 10.5% undertriage among trauma patients at HUH. Our data imply a rate of undertriage at HUH which is more than twice as high as national recommended benchmarks . Scandinavian studies have reported similar or higher rates at other Trauma Centers [32–35]. Studies from American Emergency Departments have found even higher undertriage, ranging from 40 to 70% [27, 36], demonstrating that assessing injury severity remains a significant challenge. The high rate of undertriage among elderly trauma patients is also described elsewhere [24–28, 37, 38], including in studies using “Field Triage of Injured Patients” [25, 28]. Our data shows a skewness towards high age, but the small sample size prevents us from making any firm conclusions. Moreover, some have pointed out that vital signs are less reliable to predict injury severity among patients > 65 years of age [37, 39]. Other studies have found increased mortality risk among elderly patients after ground level falls [40, 41]. Such MOI is not severe enough to activate trauma team, and the high-risk patients should therefore be identified by different means. Additionally, elderly injured patients raise unique challenges, such as potential for higher degree of comorbidity, use of anticoagulants, higher operative risk, and secondary medical complications. As a consequence, the trauma related mortality is higher in the geriatric population [42, 43]. To counter this, high age alone has been suggested as a criterion for trauma team activation [44, 45]. This is not current triage practice in Norway . 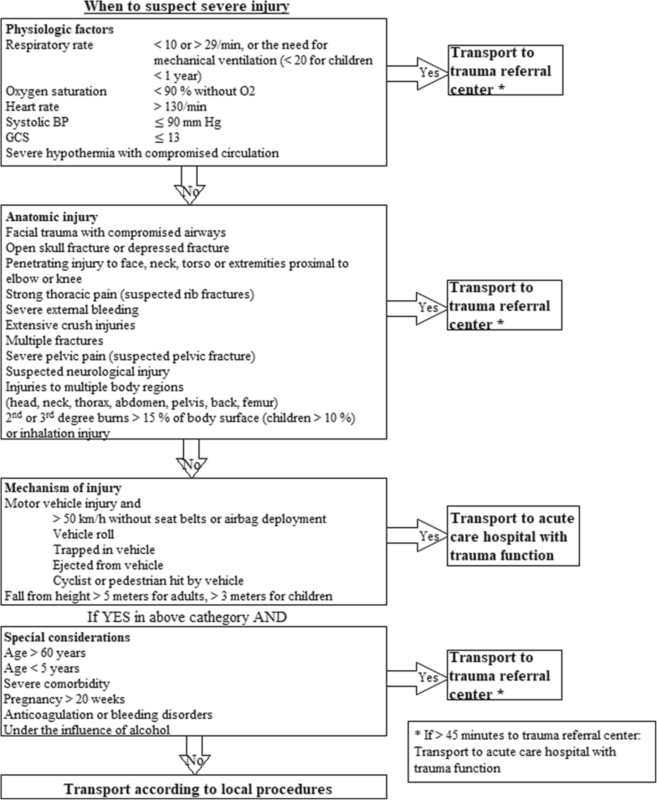 Still, age > 60 years is a criterion under “Special considerations” which should lower the threshold for trauma team activation and referral to regional trauma center if transport time < 45 min. Awareness of the special circumstances related to this patient group might aid the triage process and possibly reduce trauma mortality. Several studies have found that undertriage regularly affects patients with head injury [24, 27, 33]. Xiang et al. reported that > 40% of the undertriaged trauma patient diagnosis were TBIs (See Appendix for definition). Our data showed the same trend, as more than half of the patients (6/10) were diagnosed with TBI. TBI leads to increased mortality and permanent disabilities [46–50], making early access to proper care crucial. Vital signs have been proven useful when identifying severe trauma [32, 51–53] and GCS has shown to be a good predictor of mortality [54–56]. Pearson and colleagues found that patients with TBI (See Appendix for definition) and a GCS score ≤ 13 were 17 times more likely to die compared to those with a higher GCS score, after controlling for age, gender, race, ISS and length of hospital stay . Others have criticized GCS for its poor ability to predict isolated head injuries among older trauma patients . Our findings suggest that the “Guidelines for Field Triage of Injured Patients” have a higher sensitivity (95%) than indicated by recent studies [25, 28]. The lowest sensitivity (66%) was reported in a prospective study from 2016 including 53,487 patients . A contributing factor behind this discrepancy could be that our study population was sampled from a single regional trauma center only, excluding acute care hospitals in our health region. We are unable to determine to what extent severely injured patients were incorrectly transported to acute care hospitals with trauma function, without access to the relevant care. This means that our study cannot appraise the guidelines’ ability to identify patients suitable for direct transport or transfer to a regional trauma center, only their ability to identify in-hospital severe trauma and need for trauma team activation. Consequently, we can neither confirm nor disconfirm the findings of recent studies suggesting that transport to lower tiered hospitals (both trauma and non-trauma hospitals) contributes to the guidelines’ low sensitivity [25, 28]. Although the “Guidelines for Field Triage of Injured Patients” had a high total sensitivity (95.0%), only 68.0% of the severely injured patients were identified based on vital signs alterations, proving that vital signs alone were insufficient to identify severe trauma. However, the sensitivity improved substantially by combining vital sign deviations with defined anatomical injuries. Cook and colleges hypothesized that the use of vital signs and anatomical injury alone might be sufficient to identify need of trauma team . MOI alone was able to identify only a small portion of severely injured patients. However, MOI inclusion was required to achieve the desired 95% sensitivity, which is in line with what prior studies have indicated. Based on our limited data, we recommend adherence to the new guidelines and propose implementing simple tools such as checklists to use both out-of- and in-hospital. There are several limitations in our study. The most important one is the low sample size, due to both short study length, low trauma volume and the amount of severe trauma admitted to HUH per year. The findings should therefore be interpreted cautiously, bearing in mind the possible implications low sample size may have for their representativeness. Additionally, only patients admitted to a single trauma referral center was included. It is therefore possible that regional characteristics have influenced our trauma population. Only ISS score was used to evaluate trauma severity. This is recommended by both the national trauma plan and American College of Surgeons in quality assessment [18, 19], while being challenged by others for its low ability to predict outcome compared to other trauma scoring systems [60–64]. Patient injuries were recorded using ICD-10 codes. Given the possibility of erroneous coding in the discharge papers, some undertriaged patients may have been missed. Lastly, each injury was assigned the closest corresponding AIS-code, a procedure that could reduce the accuracy of the individual injury descriptions. Undertriage at HUH was 10.5%. Among the undertriaged, elderly patients with low level falls and subsequently isolated head and neck injuries dominated. With correct use of the modified version of “Guidelines for Field Triage of Injured Patients” the rate of undertriage could have been reduced by more than 50%, thereby keeping in line with the recommended < 5% undertriage. Our data indicate that the guidelines have a high sensitivity when identifying severely injured patients in need of trauma team activation. The datasets generated and/or analyzed during the current study are not publicly available due to it being part of the local trauma registry but are available from the corresponding author on reasonable request. TN contributed to the manuscript with design, acquisition and analysis of data, drafting and revision. PO contributed to the manuscript with acquisition and analysis of data. AB contributed to the manuscript with idea and revision of the manuscript. KU contributed to the manuscript with idea, design, drafting and revision of the manuscript. All authors read and approved the final manuscript. Abbreviated Injury Scale is an anatomical-based coding system. As explained in the AIS 2005 manual (update 2008) each injury is assigned a unique seven-digit code describing type, location and severity. Severe (life threatening, survival probable). In order to calculate the Injury Severity Score (ISS) the body is divided into six body regions. The manual describes ISS as the sum of squares from the highest AIS grades in the three most severely injured ISS body regions. A, B and C are the AIS scores from the three most severely injured ISS body regions. The ISS score ranges from 1 to 75. Any injury assigned an AIS 6 leads to an ISS 75. In order to uncover every severely injured trauma patient, we used four sets of exclusion criteria in our filtration process. First, departments considered unlikely to admit severe trauma were excluded (Table 1). Secondly, patients with single injury ICD-10 codes resulting in AIS ≤ 3 were excluded. Thirdly, patients with multiple injuries in the same body region where the highest injury gave AIS ≤ 3 and where there were no injuries to other body regions were excluded. Lastly, patients identified as being met by trauma team were excluded using HUH’s local trauma register. The filtering was done by using advanced filtering functions in Microsoft Excel 2013 (v15.0). This process excluded a total of 27,865 patients. The remaining patients were manually reviewed. 2 × 2 Contingency table for defining undertriage. We defined TBI with reference to the following ICD-10 codes: S06.0-S06.6. Xiang and colleges defined TB with reference the following ICD-9 codes: 800.0–801.9, 803.0–804.9, 850.0–854.0, and 959.01, excluding 995.55. Pearson and colleges defined TBI with reference to the following ICD-9 codes: 800.0–801.9, 803.0–804.9, 850.0–854,1, 950.1–950.3, 959.01. No need for daily support but may require special adjustments at work. Medicine, A.f.t.A.o.A. Abbreviated Injury Scale. Available from: https://www.aaam.org/abbreviated-injury-scale-ais/ [cited 7 April 2018].